At the beginning of the nineteenth century, the explorer and ornithologist François Levaillant (1753-1824) created the then most compelling work on parrots, the Histoire Naturelle des Perroquets. The monograph was published by Levrault between 1801 and 1805, comprised of two volumes and 145 plates. For the illustrations, Levaillant asked Jacques Barraband (1768-1809), as his bird watercolors were considered masterpieces of French ornithological illustration. Barraband was held to be one of the greatest bird illustrators of his time, impressing even Napoleon Bonaparte, who later became his patron. Ornithological works had considerable appeal for educated readers, primed by several decades of writing which drew a symbolic connection between birds and 'sensibility'. With Histoire Naturelle des Perroquets Levaillant focused solely on parrots. contributing vastly to the ever-increasing study of ornithology, a specialist field of natural history that had previously only been studied on a small scale. Combined with the discovery of new printing techniques, it met the new demand for beautifully produced works. This resulted in a monograph on parrots with outstanding comprehension, quality, and refinement. Levaillant’s bird books with lavishly colored illustrations formed a legacy hardly matched in the history of ornithological publication. This watercolor is a lovely depiction of the vibrantly colored Eclectus parrot (Eclectus roratus, Müller 1776) (ill. 1). This medium-sized parrot can be found in the Melanesia region and northeastern Australia. The Eclectus is a very unusual genus in the parrot family and has puzzled scientists for centuries. Of all parrots, the Eclectus parrot is the most sexually dimorphic. The colors of the plumage contrast vastly, which is such an oddity that it caused incorrect descriptions of the birds for decades. The males have a bright coral and yellow upper bill, red flanks, and mostly bright emerald green plumage. As for the females, they have virtually a complete opposite color scheme; a black bill and a predominately red coloration of varying shades, and most subspecies have beautiful blue or lavender-purple breast feathers. Even the eye color of the genders differs (ill. 2). Their head and breast feathers look like silky hair which makes them, combined with their bright colors, uniquely beautiful. Males and females differ so much that they were long thought to be different species. The first males were described by P. L. S. Muller in 1776. Even great naturalists like John Gould were tricked for a long time. It was not until 1874 that males and females of this species were finally united under the same name. The Eclectus has an unusual and complex breeding culture, resulting in communal breeding, where uncles and aunts help rear young in a group family situation. Unique to this family of parrots, they are polygamous and polygynandrous. Their breeding strategy could be the reason for the sexual dimorphism. Presumably, the female is so vividly colored because she stays in her nest for up to 11 months out of the year and her bright plumage helps the males locate her. She rarely leaves her nest and is totally dependent on the males to feed her throughout the year. The males, being primarily green, blend in with the forest as they travel from nest to nest in hopes that one of the females may select him as a mate. Eclectus parrots are very intelligent birds and are classified among the top three parrots for talking ability, rivaling the African Grey and Amazon parrots. They have an empathetic nature and a laid-back personality that makes them very favorable as pets. In his monograph, Levaillant included three Eclectus parrots; le Perroquet grand Lori and two other varieties of the species. Currently, nine subspecies of Eclectus parrots are recognized. 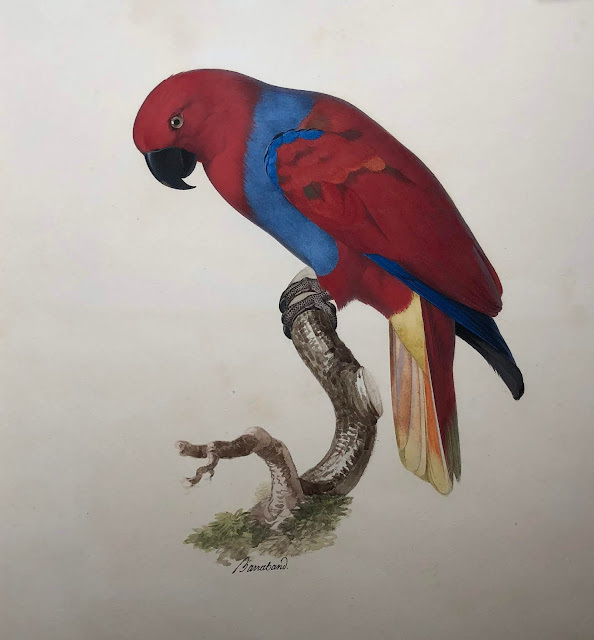 The female on this watercolor has a lavender colored breast and a yellow vent and underside of the tail, therefore it can be identified as the Eclectus roratus vosmaeri. The Vosmaeri's Eclectus is found in the northern and central Moluccas with the island of Halmahera having the dominant population. As noted before, naturalists have misgendered these birds in the past. In this case, Levaillant thought the bird to be a male. Due to his connections with the upper class of Holland and Paris, Levaillant was able to see multiple specimens of these birds, such as those of the renowned Dutch collector Jacob Temminck (1748-1822). Levaillant owned a specimen as well until he let it became part of the cabinet of the Jardin des Plantes. With the Eclectus parrot, Barraband was able to portray a bird with an incredible beauty along with scientific accuracy that few ornithological artists have been able to achieve. The meticulous hand-coloring displays delicate modulations of tone and color, fine lines, and perfect craftsmanship. Its plumage has a richness, texture, and translucence, providing remarkable detail and incredibly subtle gradations of color. By painting the branch in a looser manner, he created a contrast that makes the bird itself seem more detailed. Indeed, the featured work is exceptional, as can be seen in the bright colors of the plumage, the smoothness of the dark bill, and the excellent manner in which the feet are drawn. Le Perroquet grand Lori is emblematic of Barraband’s works of art, particularly in his later period. Therefore, it is no wonder it was on the cover of the Sotheby’s 1988 auction catalog, with the sale of many of the greatest ornithological watercolors from the library of Marcel Jeanson ( (1885-1942). Later on, this work of art was in the possession of James Oswald Fairfax, a passionate connoisseur whose interest in the fine and decorative arts spanned eras, cultures, and continents. The birds pose is serene, elegant, but it simultaneously looks at the beholder as if it is keeping an eye on him. It perfectly reflects the calm yet intelligent nature of the Eclectus parrot. Levaillant and Barraband's ability to produce such a fine example of this vibrantly colored parrot is a testament to the ornithologist’s knowing eye and the artist’s exceptional talent, as well as the brilliance of this historic collaboration. Therefore, we are very pleased to offer this magnificent work of art by Barraband as part of our collection that contains many his most beautiful watercolors, being the originals for the illustrations in Levaillant’s bird books. Jacques Barraband, A Female Eclectus Parrot (Le Perroquet grand Lori), ca. 1800, pencil, gouache and watercolor on paper, 20 5/8 x 15 1/8 cm. 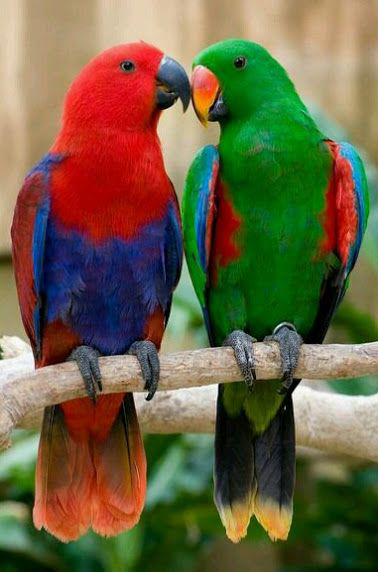 Two Eclectus parrots. Left, the Female. Right, the male. L.C. Rookmaker, P. Mundy, I. Glenn. E. Spary, François Levaillant and the Birds of Africa, Johannesburg: The Brenthurst Press, 2004, p. 129. L.C. Rookmaker, P. Mundy, I. Glenn. E. Spary, François Levaillant and the Birds of Africa, Johannesburg: The Brenthurst Press, 2004, p. 149. Where multiple males mate with one female. where both sexes have multiple sexual partners. Sotheby's Monaco S.A.M., Bibliotheque Marcel Jeanson ; deuxieme partie ; ornithologie. 1988, The Hillingdon Press.